So it’s a bit early for anything Christmas-related, but I’ve already started making my Christmas cards. I always try and make them by hand, since I really enjoy the process, and I feel that a nice card becomes a present in itself. Most of my cards will probably be Jerry -inspired. I swear I’m not a crazy cat lady. Last year I wasn’t in the best of places due to stress and work, so I barely made any. I regretted it as I gave my Christmas gifts. I felt that something was missing. This year I’m in a much better place. And it shows through the fact that I’m already working on cards and that I’m so excited (rather than daunted) to make them all! I definitely have been busy, especially with the wedding coming up in just a couple months, but I’m still finding time to work on my projects. It’s a great feeling. And starting early will give me enough time to make them all (hopefully). I wish for positivity and happiness for all of you. And if you don’t have it right now, I hope it comes to you soon. No waste, no waste. Every breath counts. No waste, can’t waste. Don’t let it burn up unused. It’s such a luxury. A few minutes and then it’s gone. A few moments of warmth in the lungs. A few moments of warmth against the cold of the world. What a waste. I’ll miss it when it’s gone. Life has definitely taken a turn for the busier. Between settling into a new job (which I absolutely love), wedding planning, and trying to make it out to the island as often as possible to help out with renovations, my writing has been slightly neglected. So while I do have a few posts drafted, I haven’t been posting nearly as much as I want to. I did, however, want to do a very short post about my new discovery: Washi Tape! Gorgeous details on the tape! It’s nothing new to many people, but it’s something I had never even heard of before. It’s a papery tape that’s slightly translucent and can be used for decorating and labelling. It’s so versatile and incredibly fun! Since I started working at my new job, I’ve been extremely inspired to be as creative as possible. So I decided to try using washi tape to decorate my wedding invites, and I really love the results! I’ll definitely be using it a lot in the future. I try, as much as possible, to make my cards by hand. I don’t always have the time, and I’m a sucker for Papyrus cards… but most of the time I like adding that extra personal touch. After a bit of a break from painting, I’m still getting back into using watercolour and remembering its unpredictable and finicky tendencies. But I love how calming it is. How much fun it is to play around with colours and watch as they interact. This card took me two tries. The first one didn’t turn out so well, but allowed me to get a feel for the way I wanted the colours to move. I find that, much like writing, the second drafts and those thereafter are much more refined. I am hoping that eventually I’ll paint cards that I can sell on Etsy or in local stores. Cards that are heartfelt in their colours and messages. Because we don’t always have the time to make our own, but sometimes we want to show people just how much we care. And I believe that art can do just that. Mondays mean breathing in the new week, stepping into its embrace. No matter how tired, how reluctant. Mondays are sleepy days for me. And as I sit at my desk, I find myself seeking ways to open my mind creatively. Colours to brighten my day. It normally starts with a quick sketch. Something simple to ease myself into practice. Then I pick up my paintbrushes, and delve into colours. Bright ones, today. The sun filters through the leaves outside. The air picks them up, and they murmur. This I mirror with my brush upon the paper. Mondays can be difficult. But finding enjoyment in splashes of paint is not. Something incredibly exciting happened recently: I got engaged! I’ll try not to gush too much, but it’s much too exciting not to share it with you all. Marriage was never the end-goal in my life. But the romantic part of me, which usually likes to hide away, really, really loves the idea of getting married to the person I love most. Apparently my fiancé had been planning the proposal for months. I was oblivious to it all, which made the surprise all the more special. It was private, and intimate, and absolutely perfect. Of course, we’ve had to get the ring resized twice, since apparently my fingers are smaller than estimated. Now that we’ve had time to enjoy our time as newly-engaged, it’s time to start planning the wedding! This means a lot of work between now and December. This certainly will not become a wedding blog, but there may be various updates on the process. We will be doing a lot of it by ourselves, so there may be some frustrated rants. I’ve started drafting wedding invite cards! On that note, any advice and recommendations are very welcome! We will be having a very small wedding, but I don’t doubt there will be much to do. I would love to hear your experiences and any tips or tricks! Still looking for the secret to balancing life. Got any leads? Been busy, as usual. Haven’t been writing as much as I was hoping I’d be able to. I do have a short horror flash that I’ll be posting before the end of the month, though. In time for Halloween! In the meantime, here’s a quick sketch and painting I did. Sketch paper and watercolour. Around 10 minutes. A quick painting I did not long ago. Having fun with the colours. Enamoured by the muted colours from the mountain top. The calming end to a vivid day. My heartbeat slows to the soothing of my soul as the sun sets with a mother’s smile. Came across this bird on the internet. Fell in love with its beautiful plumage. Such gorgeous tail feathers. 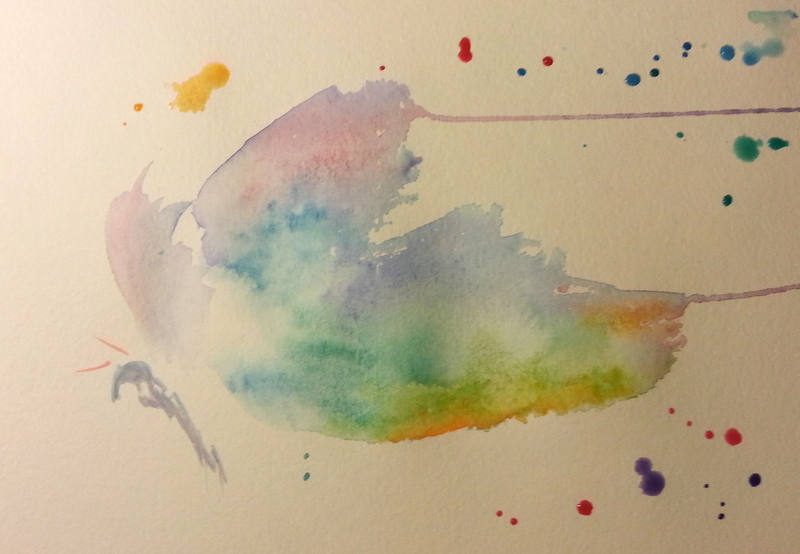 So I did a really quick sketch, and brief watercolour overtop. On sketchbook paper, about five minutes. Weary wings from a long journey home. Rest and rejuvenate on the scent of blossoming life. A bit overwhelmed with work and life these days, so a short post and a recent painting. Two weeks until vacation. Whisper sweet words upon your blank canvas. Fill it with the colours of your thoughts. Speak with broad strokes of life, sharp, angular, with sweet trailing ends that flutter towards the edge. Mist a perfume of melodies, gold and silver, to harmonize in twining waves, origins and eternity. Place it on your wall, display it for others to see, share the warmth of life that emanates from the core of your heart. Processes, purposes, and all the canvases we have created. There’s a darkness in this room now. The taint spreads from the corner. The window through which you violated my sanctuary. You oozed your way in, desperate, thieving. You snatched memories from my shelves, cruel in your careless swipes and disregard. Your selfish desire. You linger even after you sprint away from the crime. Your greedy hands pilfer the happiness from my mind. I can feel you staring, a faceless shadow. You don’t realize how much of a violation it is until it’s your home that’s broken into. It was only amazing support from family and friends that got me out of the strange funk I was in after it happened. But if he was so desperate to break into a house and steal, then he must be at a low point in his life. The sentimental value was the hardest blow. Items I can always replace. But his actions will follow him for the rest of his life. And with these thoughts, the anger drains. And all I can do now is hope that he finds a better path. I long for your sweet serenades. Your claims that peal like bells from the tallest towers. Awaken me with your melodies. Fill the air with possession. Winter was long and silent in your absence. The air had not the warmth of your sound, the world lacked the colour of your songs. The sun could not break through the clouds without your calls to guide it. Come home now. Bring with you the blossoming flowers and green winds of life. Let spring smile upon our faces. I started painting a couple weeks ago. Now I have all these ideas to go along with them. Art sourced from my deviantart account.